July 12th is the celebrated birthday of His Holiness the 33rd Throne holder of Menri Monastery and Leader of all Yungdrung Bon, Lungtok Tenpe Nyima Rinpoche. He was born in Amdo, Tibet in 1929. 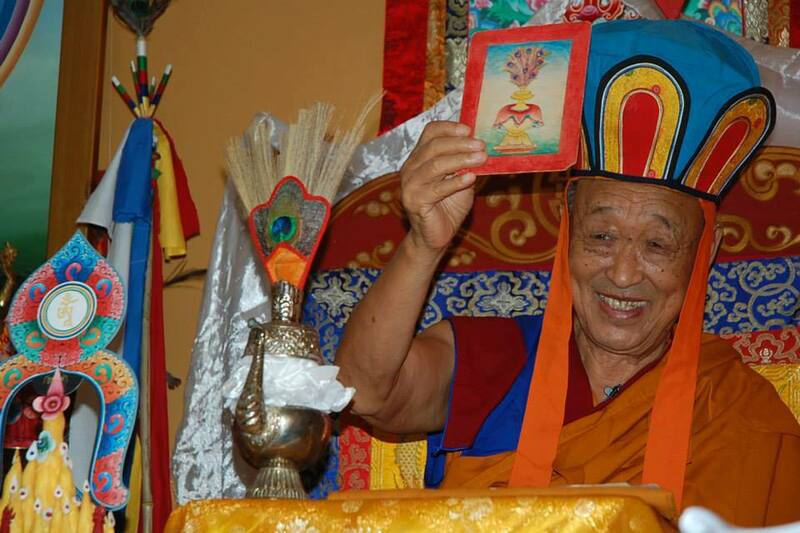 At the age of 25, he received his Geshe degree. The next year, he underwent the arduous task of traveling and collecting Yungdrung Bon scriptures in order to print copies and therefore preserve the ancient knowledge. After that, he studied at the renowned Tibetan monasteries of Menri and Yungdrung Ling. In 1959, he fled Tibet for Nepal. Arriving at the ancient Bon monastery of Samling, he collected many of their rare texts and woodblocks in order to again print texts for the preservation of knowledge. Eventually traveling to New Delhi, he worked with E. Gene Smith for the copying, printing and preserving of numerous Bon texts. In 1962, he traveled to the University of London after having received a grant from the Rockefeller Foundation. During his time in London, a permanent camp for Bon refugees was established in Dolanji, India on land chosen by Yongdzin Tendzin Namdak Rinpoche. In the mid 1960’s, he was living in Norway and working with the Tibetan scholar Per Kvaerne and teaching Tibetan history and religion at the University of Oslo. It was while he was in Norway, that he learned that he had been chosen to become the 33rd Menri Trizen, or throne holder, of all Yungdrung Bon. In 1969, he assumed his duties as Menri Trizen and began his tireless effort to rebuild the destroyed Menri Monastery of Tibet at the location in Dolanji. Currently, Menri Monastery has many temples, a library, a medical center, dormitories, and a nunnery. In addition to the monks and nuns in residence, there are over 350 children living at the Bon Children’s Center who gives them an education as well as providing for all of their needs. In all of these activities, His Holiness Lungtok Tenpe Nyima Rinpoche has worked with great effort and kindness in order to protect and strengthen the culture, knowledge and spiritual activities of the ancient tradition of the Yungdrung Bon. Posted on July 11, 2014, in Preservation, Tibetan Culture & History, Tibetan Lamas, Uncategorized and tagged Menri, Tibetan culture, Tibetan history, Tibetan Texts, yungdrung bon. Bookmark the permalink. 2 Comments. A friend and I visited Menri in February 2000 and met His Holiness, who was charmingly unassuming and friendly (even though he called us “spiritual tourists”! The monastery was then only a few buildings, with new construction underway. We later met him again in McLeod Ganj at the celebration of HHDL’s enthronment and he was equally kind, remembering us. I met H. H. Lungtok T. Nyima in 1990 and I’ve really enjoyed Menri and the kindness of monks and gheshes. In that occasion I’ve received the last part of the Shang Shung Nyen gyu transmission which first part I’ve received by Tenzin Namdak in Merigar. I’ve been deeply moved touching the spheric relics of a rainbow body practitioner of the past. I’ve tried to help the health of some kinds and monks and I’ve really enjoyed the kind advices of H. H.. Thank you again for being there and for reaching the west with the lighthouse of your wisdom.